It’s #OneBallStateDay, and the English department wants to thank our community for continuing to give back so that we can fly forward. Your gifts are used for lots of different purposes, and if you’d like to help us continue our good work, here’s where you can help. Consider donating to the Ball State English General Fund #2701 in particular to ensure that our students and faculty continue to make a difference. Want to learn about a few of the projects which this fund has supported in the past year or so? 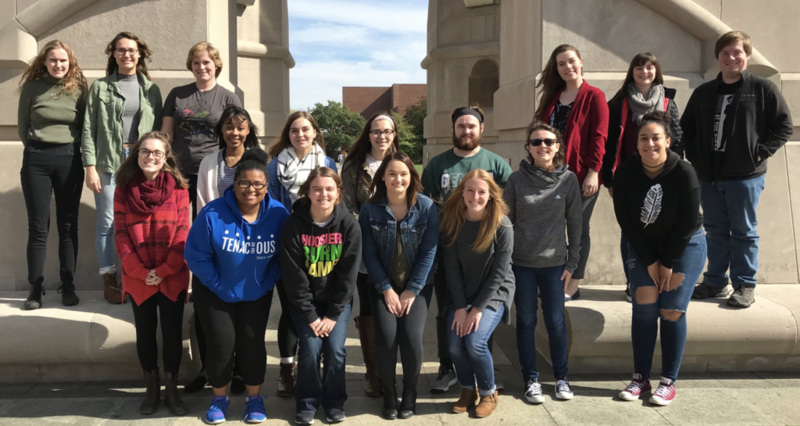 With your help, we recently raised over $4000 via crowdfunding to send 10 Sigma Tau Delta English Honor Society members to St. Louis to present their work! We were especially glad that so many young alumni gave to this effort. Your donations paid for all their expenses–hotels, food, registration, and of course, Ball State vans! This crowdfunding campaign also reached its goal of $1000, thanks to you! This money will help 12 students attend the Butler Undergraduate Research Conference. The Butler Undergraduate Research Conference provides undergraduate students from across the country with the opportunity to present their research and creative works. The DLR will present their capstone projects on utopian and dystopian themes. They will also be sharing a group presentation about the DLR as an immersive-learning course offered at Ball State University. Class members attending the conference: Kneeling, first row: Filasha Finley, Troi Watts, Natalie Kuss, and Marlee Jacocks. Standing, middle row: Rachael Carmichael, Taliyah Jarrett, Maggie Mayer, Kirsten Cooper, Ben Sapet, Marisa Sloan, and Stephanie Alana. Standing, back row: Samantha Kubiak, Katrina Brown, Leah Heim, Alyssa Malott, Allison Akers, and Jacob Garrett. Not pictured: Kylie Poling and Sammy Bredar. 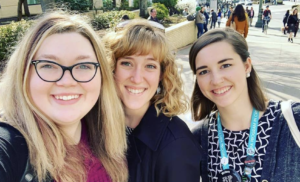 Thanks to your gifts, we sent three graduate students to the 2019 Association of Writers and Writing Programs (AWP) Conference in Portland, OR. You helped (l to r) Rachel Lauve, Valerie Weingart, and Lindsey Dirksen fly to Portland and pay for their hotel room. They manned the Ball State table at the book fair, attended lots of panels and readings, met lots of writers and teachers of creative writing, and brought back a lot of books. 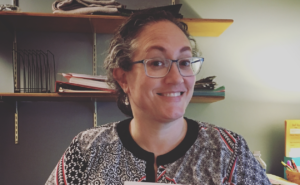 Prof. Cathy Day is piloting a new career class in the English department, and she used foundation funds to help defray a few of the costs. 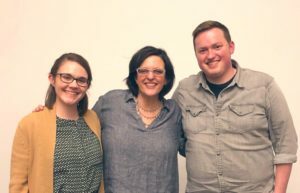 With your gifts, we were able to pay a small honorarium to two out-of-town speakers: Dr. Anna Stumpf who traveled from Anderson University to talk about using LinkedIn, and David Griffith who traveled from South Bend to discuss making a life as an artist. Learn more about who came to visit the class and what they discussed with students. Prof. Day applied to the Passion Planner Community Empowerment Program and received 30 free planners (red, of course). 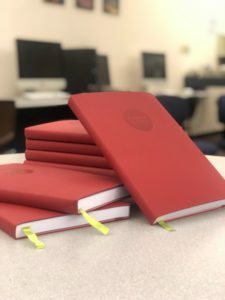 Your gifts paid the shipping costs, and now, all the students in this course have a planner to help them set goals and take steps to attain them! There’s a saying in the world of philanthropy: You can help humankind by giving your time, your talent, and/or your treasure. So far, we’ve highlighted what can happen when people give a financial gift to the department, but we also benefit from those who share their time and talents with our students. In March, we held a Stars to Steer By career event on publishing and three recent alums returned to Muncie to share their career journeys. Daniel Brount, who works in New York at Skyhorse Publishing, visited via Skype, and Niki Wilkes and Brandon Buechley traveled from Notre Dame and Indianapolis. Learn more about their career journeys on our blog. Are you interested in giving your time and talent on #OneBallStateDay? Contact Prof. Cathy Day and learn more about how you can pay it forward. Because there are thousands of Ball State English alums out the world, and if even half of our alums gave just $10, we could do even more good work here at Ball State, in Muncie, and in Indiana. The English General Fund #2701 is integral to the future of #bsuenglish. Click here to give. And if you gave already this year, we really do thank you!